Tapzo Coupons, Promo Codes & Offers: Do you love to do things online? Do you order foods, book cabs, movie tickets and shop from online? If yes, then have you ever realised that you’re doing these things by using different apps or website. I mean, you are ordering food from one site, booking cabs from another site and doing the rest using other specific sites or apps. Have you ever thought? What if you get all the facilities in one app? Yes! Here comes Tapzo! Tapzo (formerly Helpchat) is now India’s #1 app that allows you to do the work of 35+ different mobile apps in one place. And in this article, we are going to share a list of Tapzo promo code, coupons and offers. Using these Tapzo offers, you can get discount and cashback from your order. Currently, Tapzo app has got over 50,00,000 installs in Google Play Store. That means a large number of people are using Tapzo app to place an order, book tickets, pay bills, recharge mobile or DTH, etc. So, using these following Tapzo coupons, you can save a lot of your valuable money. These Tapzo offers will give you the exclusive discount, huge cashback and many more benefits. Every Tapzo coupons we have listed below are fresh and working. So, start using coupons and start saving. 1.3.1 How To Earn Money From Tapzo Refer And Earn Program? 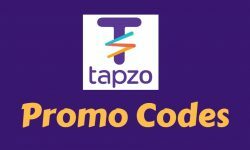 These Tapzo promo codes will help you to get discounts and cash back at the time of recharging your Mobile, Data Card, DTH, etc. and Electricity, Gas bill payments. So, why wait and stand in a large line to pay your bills. Just use these coupons and get discounts sitting at your home. Tapzo is giving an awesome offer to their new users. Now they are giving flat Rs 25 Cashback on Postpaid or Prepaid or DTH Recharge of Rs.50. Means you are getting 50% cashback. You need to use “RCFIRST50” code in the promo code box at the time of recharge. Once per user per device. Hurry up and avail this offer now. Apply “RC25” code and get Rs 25 CB on mobile or DTH recharge of Rs 50 or above. Valid once per user. This offer is applicable for selected users only. Get Rs 25 cashback maximum. Just use coupon code “RANGOON” and get a chance to meet with the casts of the movie Rangoon and also win free movie tickets. Minimum recharge amount is Rs 50 only. Apply tapzo promo code “JOY50” and get a chance to get 200% cashback from Tapzo. Minimum spending amount is Rs 50 only. Maximum cashback amount is Rs 200. Use coupon code “XBOX” before the completion of the payment and get a chance to win an Xbox gaming console. To be eligible for this offer, spend minimum amount Rs 100 and apply the coupon code. Enter tapzo promo code “PAYDTH” and get flat 10% cashback when you recharge your DTH first time from Tapzo app. Maximum cashback amount is fixed at Rs 50. Minimum DTH recharge amount must be same or more than Rs 200. Use code “GDTH10” and get flat Rs 10 cash back on your Tapzo wallet for any DTH recharge. Recharge amount must be Rs 100 or more. Maximum cash back given for this offer is Rs 10. Apply code “RDTH” and get 10% cashback upto Rs 20 on your DTH recharge. The minimum transaction amount is Rs 100. Apply tapzo coupon “FCCASH50” and get 5% FreeCharge cash when you pay with your FreeCharge wallet. Offer valid for prepaid, postpaid and DTH recharges. Apply code “TPRUPAY10” to get flat 10% cash back on all operator DTH recharges. Use your RuPay credit or debit card for the payment. Min spending amount must be Rs 100. Maximum cashback amount is Rs 25. Use the Tapzo promo code we have listed below, and you will get exclusive discounts and cashback on Ola cab rides. Just use these coupons before the completion of the booking and get an extra price cut on your next Ola cab ride. If you are going to book Tapzo cab ride, then you can grab 30% cashback in your Tapzo wallet by applying “CAB30” code. Valid on 1st time Ola cab booking. Spend minimum Rs 80. Get up to Rs 30 cashback. Use tapzo promo code “CABFEB5” and get 5% CB on your next Ola cab ride. Get up to Rs 50 cashback. Spend the minimum amount of Rs 40 to get this offer. Apply tapzo coupon code “OFFER20” to get flat 20% cash back to your Tapzo wallet. Min spending amount is Rs 40. Max cashback for this offer is Rs 15. Just use code “TAP4” when booking Ola cabs first time from Tapzo app and get flat 20% CB. Spend min Rs 50. Max CB amount is Rs 20. Enter tapzo promo code “ASSURED50” and get upto Rs 50 cashback on Ola cab rides when you book it using the Tapzo app. Min spend amount Rs 40. Max CB amount is Rs 50. Some terms and conditions apply for this offer. Use coupon code “LUCK” and get a chance to win 50% CB from Tapzo app. 50% CB will be given only to 100 lucky customers each day. Min spending amount is Rs 40. Get some other Tapzo coupons here. Use these code for food orders, bill payments and local deals. Just apply these codes before giving the payment to Tapzo app and enjoy flat cash backs, extra price cut & exclusive discounts. Use code “GRAND50” and get upto 50% cash back on local deals. Valid for both new and old Tapzo users. Offer valid twice per user. Min spending amount for this offer is Rs 60. Maximum CB amount is Rs 50. Use code “SWIGGY50” to get flat 50% cash back on your first food order from Swiggy using Tapzo app. Min spending amount is Rs 150. Max CB is Rs 150. Apply promo code “FAASOS50” to get flat 50% CB. This offer is valid for 1st Faasos order only. Both Max CB amount and Min spending amount is Rs 150. Use code “FOOD50” to get 50% CB for your first food order from Swiggy, Zomato, Freshmenu and Faasos. Max CB amount is Rs 150. Min spending amount is also Rs 150. You can also earn money by referring Tapzo app to your friends and family members. Currently, Tapzo is giving Rs 20 for each referral. If your friend downloads the app from your referral link, the both you and your friend will get Rs 20. So, it’s beneficial for both the referred person and the referrer. To get Rs 20, your friend must book first Ola cab ride of Rs 100 or more. Earn up to Rs 1,000 by referring Tapzo app. How To Earn Money From Tapzo Refer And Earn Program? 1) Firstly, download Tapzo app from this link. 2) Now signup or login to the app. 3) Get your unique referral link from the app. 4) Start sharing your referral link with your friends. Tip: – Share your referral link on social media sites like Facebook, Twitter, Whatsapp, etc. to earn more from Tapzo refer and earn offer. 1) You can earn maximum Rs 1,000 by referring Tapzo app. 2) Your friend must book a cab ride for Rs 100 or more. Then you will get money. 3) Your friend will also get Rs 20 on his or her Tapzo wallet. 4) Offer valid for Android and IOS phones only. 5) Your friend must book a ride within three days from referring. 6) Valid for new users only. Hope these Tapzo coupons and promo codes will help you to save your money while ordering something from Tapzo app. Now, don’t forget to share today’s Tapzo Promo Code with your friends. Because they also want to save their money. is there any code for electricity bill payments. that rec20 code say expire why..? Try this GETHC20, hurry up!! no sir that say also expire..